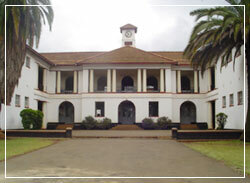 Located just outside the CBD of Eldoret, Kenya, Moi Girls' High School - Eldoret (The Highlands School, until 1978) is a top national girls' boarding school established in 1928. It is managed by the school's Board of Management appointed by the Ministry of Education of the Republic of Kenya. It is a Christian non-denominational school offering the curriculum for the secondary cycle of the 8-4-4 system of education. To Be The Premier National School For Girls. To provide high quality education, nurture talent and innovation and to develop leaders for the 21st Century. God-fearing: Living a moral life based on reverence to God. Innovativeness: Ability to use imagination to develop and apply original ideas. Focused : Having foresight and commitment to working hard and applying one’s resources to a given task. Excellence: Striving to stay relevant and to maintain healthy competitive standing both locally and globally. Disciplined: Ability to make good judgment and adaptability to diverse situations. It is our commitment to nurture GIFTED 21st Century leaders.